The student who stared and smiled at an elderly Native American protester drumming in his face outside the Lincoln Memorial as his schoolmates chanted and laughed says he did nothing to provoke the man in the videotaped confrontation and was only trying to calm the situation. The student identified himself in an e-mail statement Sunday evening as junior Nick Sandmann of Covington Catholic High School in a northern Kentucky suburb of Cincinnati. An official working with the family confirmed Sandmann’s identity, speaking on condition of anonymity because the source didn’t want to distract from the statement. Videos posted of the confrontation drew wide criticism on social media. “I am being called every name in the book, including a racist, and I will not stand for this moblike character assassination of my family’s name,” wrote Sandmann, who added that he and his parents have received death threats since video of Friday’s confrontation emerged. The duelling accounts emerged Sunday as the nation picked apart footage from dozens of cellphones that recorded the incident on Friday in Washington amid an increasingly divided political climate fuelled by a partial government shutdown over immigration policy. It was a haka – a war dance of New Zealand’s indigenous Maori culture, made famous by the country’s national rugby team. Frejo, who is also known as Chief Quese Imc, told the AP in a phone interview that he felt the students were mocking the dance. 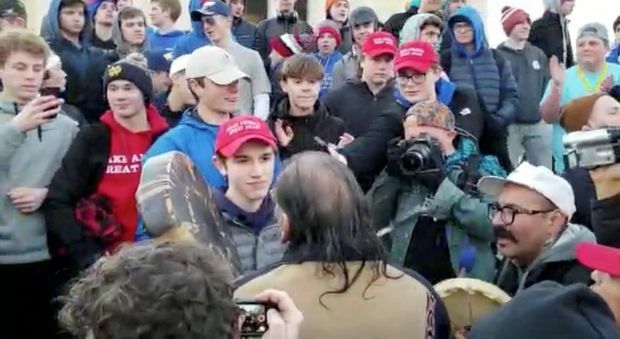 Though many commenting on the internet were taken back by Sandmann staring at Philipps, the teen said he was “not intentionally making faces at the protester. I did smile at one point because I wanted him to know that I was not going to become angry, intimidated or be provoked into a larger confrontation.” He said he had never encountered any kind of public protest before. Sandmann said he has provided a copy of his statement to the diocese and said: “I stand ready and willing to co-operate with any investigation they are conducting.” A spokeswoman for the diocese did not return an e-mail Sunday night.